just prior to the Monster Energy NASCAR Cup Series Awards. Can’t make it to Vegas? Be sure to watch the Monster Energy NASCAR Cup Series Awards exclusively on NBCSN. Check out the full 2018 NASCAR Champion’s Week Schedule below. Event Details: At the NASCAR NMPA Myers Brothers Awards, teams and drivers are recognized and awarded for their outstanding performance during the Monster Energy NASCAR Cup Series season. 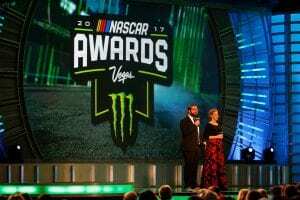 In 2017, Martin Truex Jr. and Sherry Pollex were named the 2017 NASCAR NMPA Myers Brothers Awards recipients. This year, the NASCAR NMPA Myers Brothers Awards is a FREE event for fans. 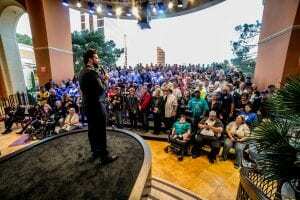 Fans can see their favorite drivers honored, including the 2018 Monster Energy NASCAR Cup Series Champion. To attend, you must reserve your spot by registering at Encore Theater at Encore at Wynn Las Vegas (November 27th from 12 PM PST – 5 PM PST or November 28th from 9 AM PST – 12 PM PST). Event Details: On the Fan Red Carpet, you’ll see the NASCAR stars just before the 2018 Monster Energy NASCAR Cup Series Champion is crowned. Get up close to many of your favorite drivers, the Monster Energy girls and the sport’s biggest names! Wait, how do I get in on this Fan Red Carpet? Glad you asked… If you are one of the first 300 NASCAR fans to sign up for the NASCAR NMPA Myers Brothers Awards, you will have access to the Fan Red Carpet. If one of the first 300 fans to sign up for Myers Brothers – we will see you at the Fan Red Carpet! To attend, reserve your spot by registering at Encore Theater at Encore at Wynn Las Vegas (November 27th from 12 PM PST – 5 PM PST or November 28th from 9 AM PST – 12 PM PST). Event Details: Tune in to watch the 2018 Monster Energy NASCAR Cup Series Champion be crowned! *NOTE: ALL TIMES ARE TENTATIVE AND SUBJECT TO CHANGE.